Counselor, instructor and partner Jacklynne Jackson talks with the women. Women Like us center is established. We’re thrilled to be partnering with Victorious Teens Bridge to establish the first women’s center in Nakuru, Kenya. Sewing instruction, chicken micro-enterprises, counseling, table banking skills and more are taking place for approximately 50 women at the center. Our goal…100 women by 2020. Want to join us in kenya in 2019? Working together with the Jendelieze Program women to learn how to sew the towels. We also talked about the basics of running a business. Teens are happy to be able to stay in school with the washable sanitary towels. Our teen girls from the USA explain how to wash and care for the girls sanitary towels. This year we repeated the process for the teen girls kits, but also included soccer balls, underwear and backpacks for the boys. Yet, it was through the wisdom and perseverance of Ann Kabui and our CEO Linda Rendleman, that we focused on elevating the women through the micro-enterprise program Ann called the Jendelieze Program. 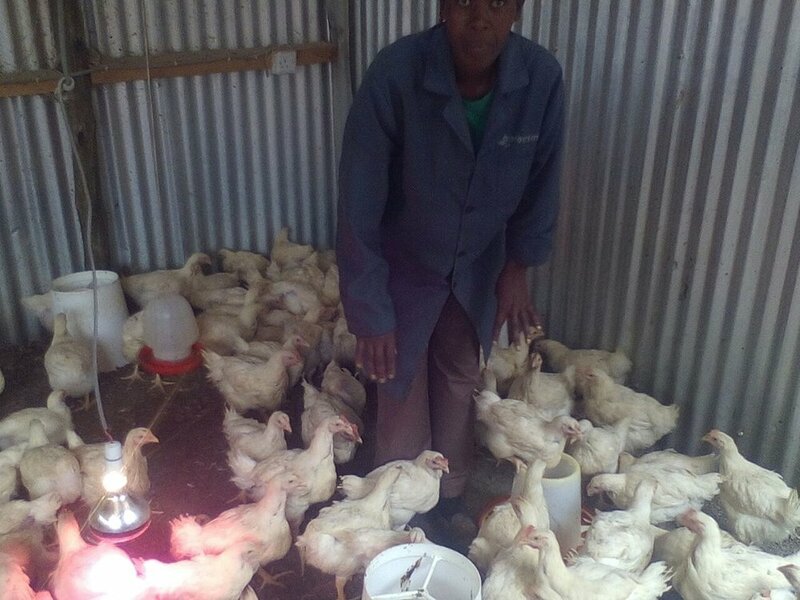 Thanks to a donor, we were able to buy chickens to raise and eventually sell to the restaurants along with planting vegetables to sell at market. Over one short year, the funds of the women's program was growing. And with that growth came respect for the women from their husbands and their children. It was our goal to show the young teen girls that they, too, can use resources and make life better for their families. The chicken project and our volunteers from America. We were thrilled to make it back to Nakuru, Kenya in June, 2017 where we met with Victorious Teens Bridge created and led by Ann Kabui. After finding them three years ago on our last trip to Kenya, we've supported their efforts for teen education. We saw the need and met the women who are making change for these children's lives. Women Like Us Foundation has funded enough sanitary towels to keep 50 girls in school for a year. Many girls in Kenya are forced to drop out of school 5-6 days per month because they have no protection when they have their menses. We have funded educational resources, such as printers for their cybercafe and field trips to job locations to encourage careers and brighter futures. Women Like Us Foundation partnered with Days for Girls and the women of the Barely Threaded Quilting gtoup along with donors to take 100 sustainable feminine hygiene kits to the teen girls of the Victorious Teens initiatives. Through the use of these kits, girls can wash the sanitary towels rather than dispose of them as is many times the case elsewhere. The impact we have made helps the girls stay in school for 2-3 years. Angela Palmieiri giving Victorious Teens founder Ann Kabui a lap top for needed access to research and learning. Victorious Teens understands that when girls get their education they need a partner that has also moved forward in his development. Women Like Us brought sports equipment and underwear for the boys, along with a laptop for all the children. We also trained the teachers how to use water filters for cleaning drinking water for all. WATCH OUR VIDEO OF THE GIRLS AND VOLUNTEERS DISTRIBUTING THE KITS. · Victorious Teens Bridge International seeks to inform, empower and nurtureunderserved teenagers towards self-realization and foster development for future leadership. They strive to be the leading organization that empowers and nurtures vulnerable teenagers and women in Africa. · This youth empowering organization was founded by a group of three women led by Ann Kabui in Kenya, Africa. This small group of women dedicated every spare minute to providing support to vulnerable teenagers while empowering their parents through “table banking” to inform and encourage independent income through specialized activities. With time, additional issues were brought the women’s attention. They noticed children were missing school due to a lack of sanitary towels and undergarments. This absenteeism led to dropouts, drug abuse, early marriages, and prostitution. Unfortunately, they became aware of a certain instances of Female Genital Mutilation (FGM) as well. As the organization grew and became stronger, more families were empowered towards independence and children were able to obtain an education.The organization has brought together people from different profession all with a common goal of making a difference in the lives of young teenagers and their parents. · In the last three years, Victorious Teens Bridge International has made great strides in improving community experience and the lives of families and children living in them. School dropouts have been reduced by 20% along with a substantial reduction in absenteeism and drug abuse. Additionally, women have started income generating activities that have even allowed a saving of surplus proceeds. Children have developed self-esteem and acquired skills that will help them in all aspects of life.